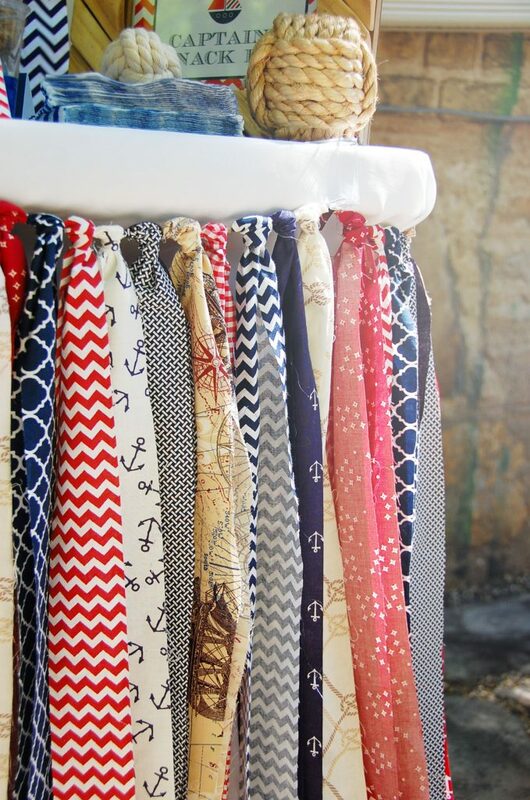 Those who know me, know I am obsessed with all things nautical. 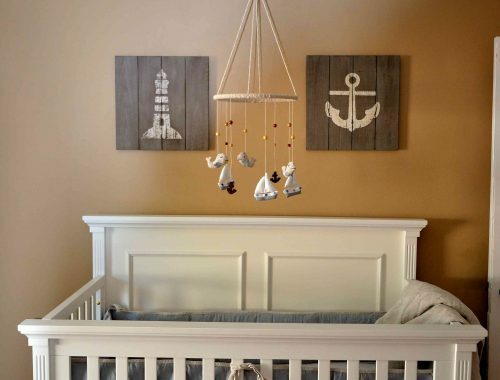 Hence why my son’s nursery was decorated in a nautical theme. 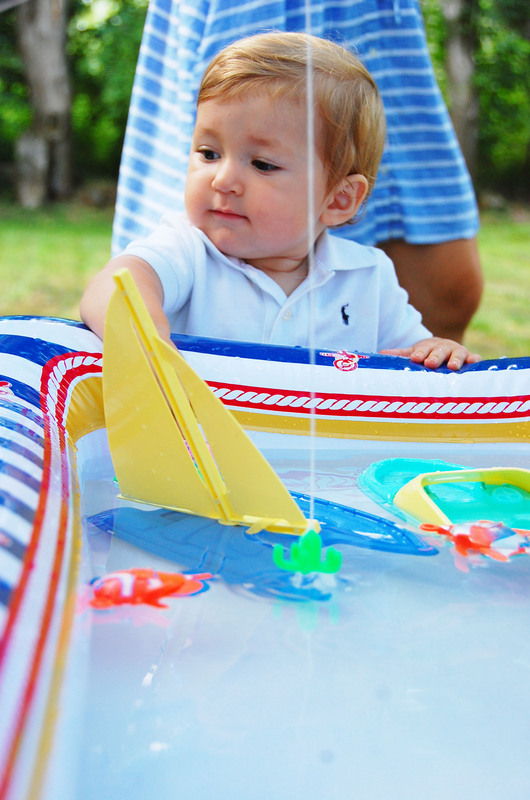 Of course, this meant his first birthday party had to be nautical themed as well! 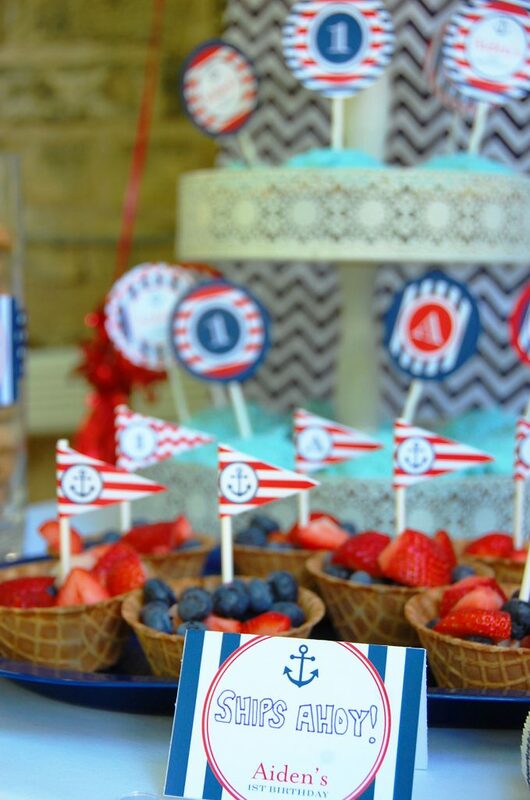 I was so excited about being able to host a nautical themed party, I could hardly wait to start planning it! 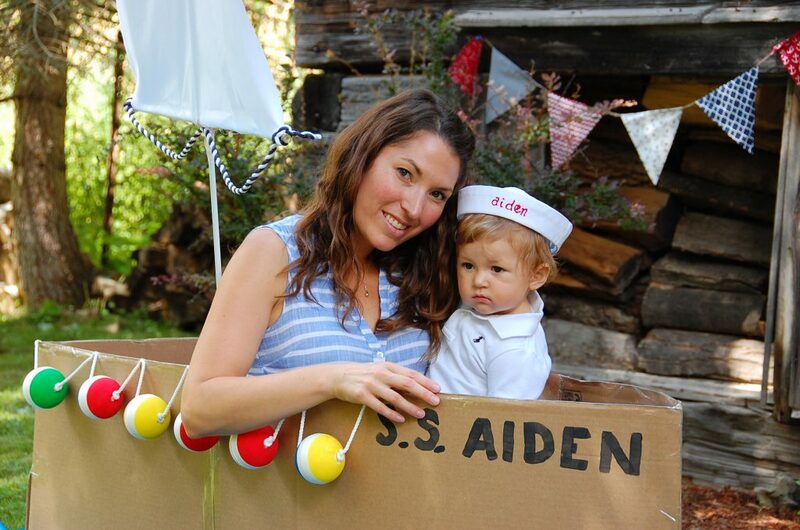 As such, in true Jodey style, I started to plan Aiden’s first birthday party months (and I mean MONTHS) in advance. 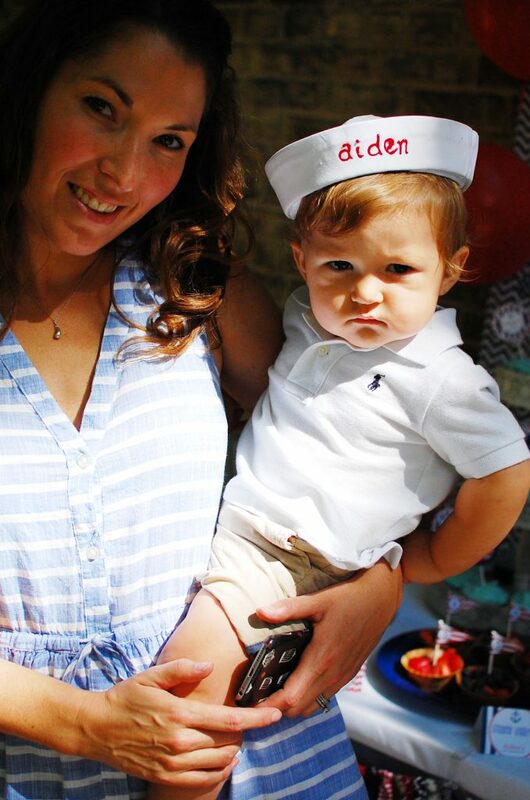 With a lot of help from my very own mama, my dad and my husband, Aiden’s first birthday party was fit for a sailor! 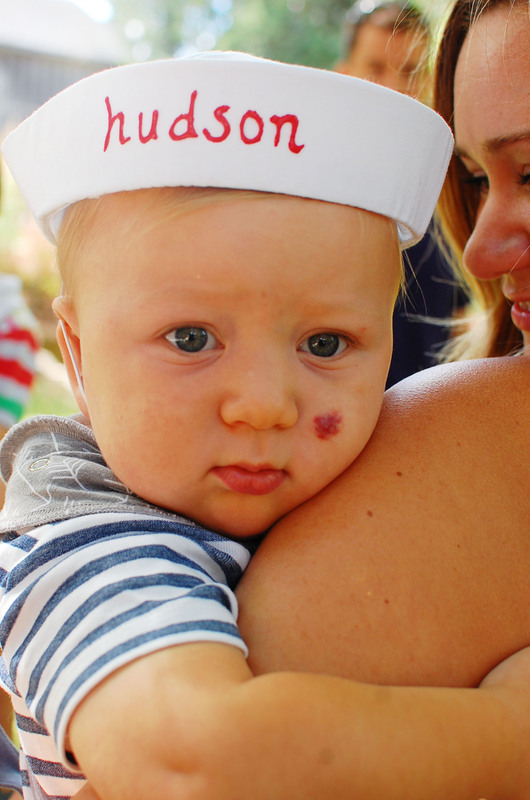 As we had nearly 50 guests attending, we hosted Aiden’s first birthday party in our own backyard. Fortunately, the weather cooperated and we had a beautiful, sunny day! 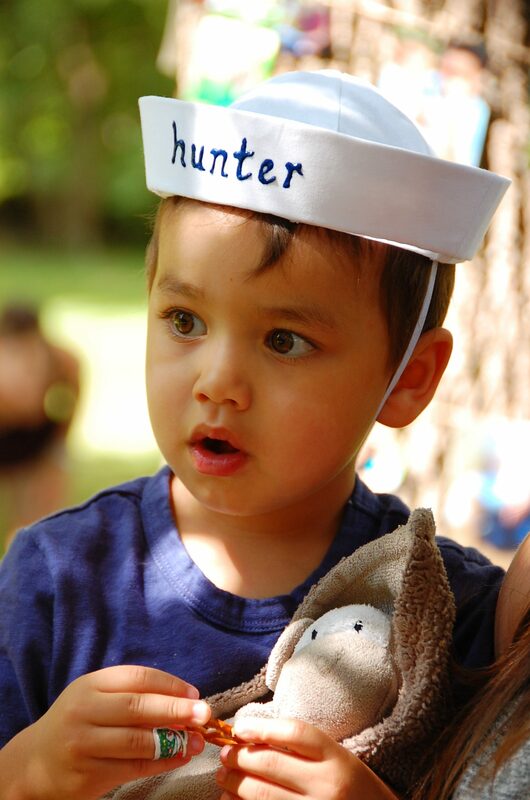 Little sailor guests were given their very own sailor “party” hat with their name upon arrival (except for the newborn baby girl guest, who got an adorable striped head band instead!). These adorable sailor hats were all hand-crafted by my mom based on a sewing pattern I found that she modified. 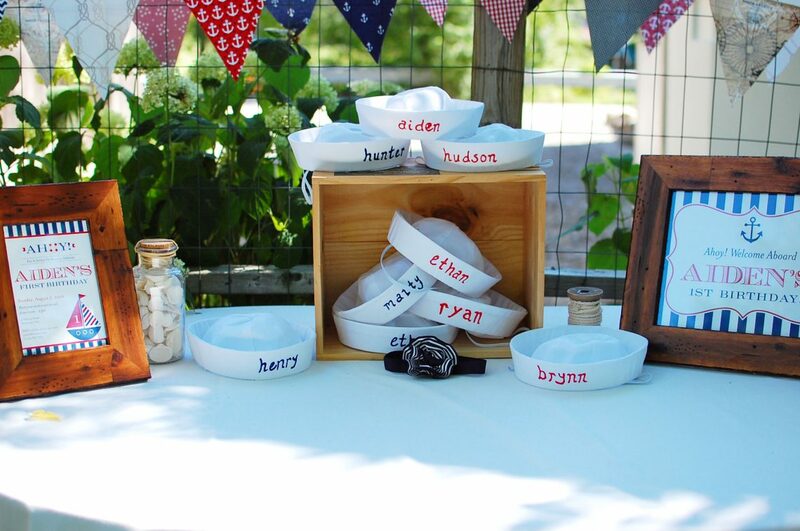 Once complete, she and I hand-wrote the names of the party guests on each hat. Sadly, we did that after a couple of glasses of wine so a few of the names turned out a bit messy, but we sure had fun! 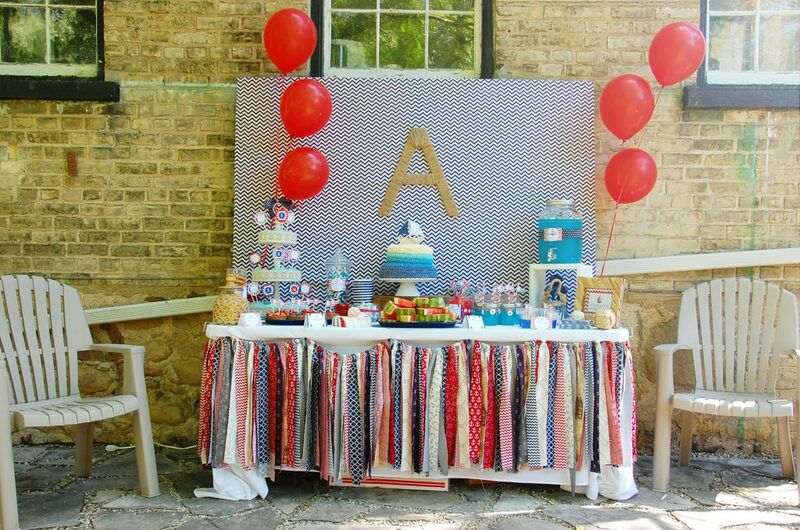 The pennant banners in the background of this picture were also hand crafted by my mom and I using materials I purchased from Fabricland and Hawthorne Supply Co.; they were used as decor throughout our backyard, adding a vintage vibe to the birthday party. In case it isn’t obvious from these pictures, I am OBSESSED with pennant banners. 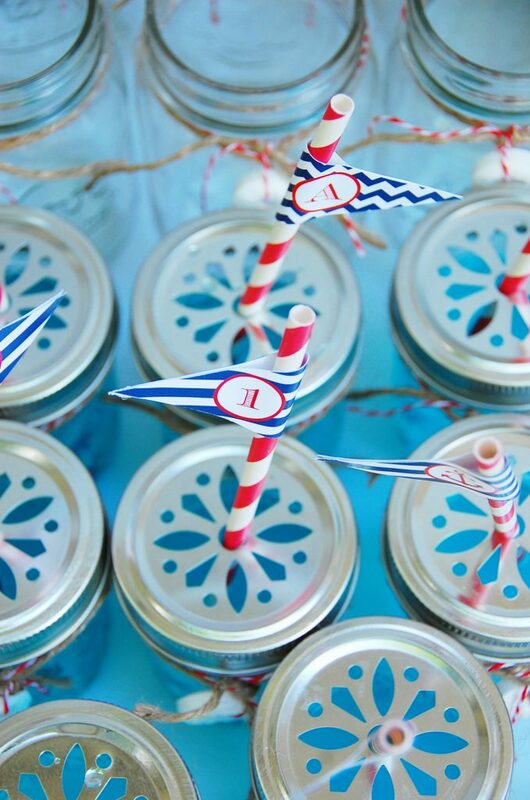 They are so simple to create, yet they add so much personality to any party! 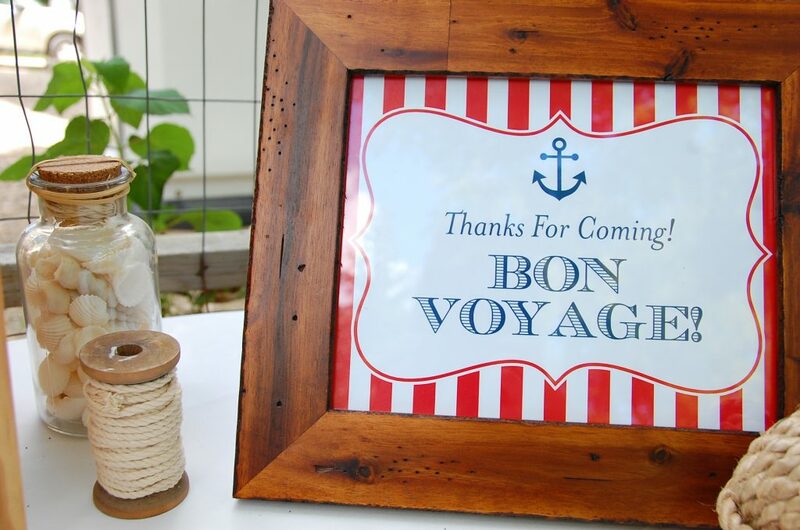 A rustic, wood framed “Welcome” sign created by the very talented Heather Dalton of Chickabug, LLC greeted guests. All paper products were created by Chickabug, LLC, then printed and assembled by my mom and I. Heather is truly fantastic to work with and I cannot recommend her products enough! 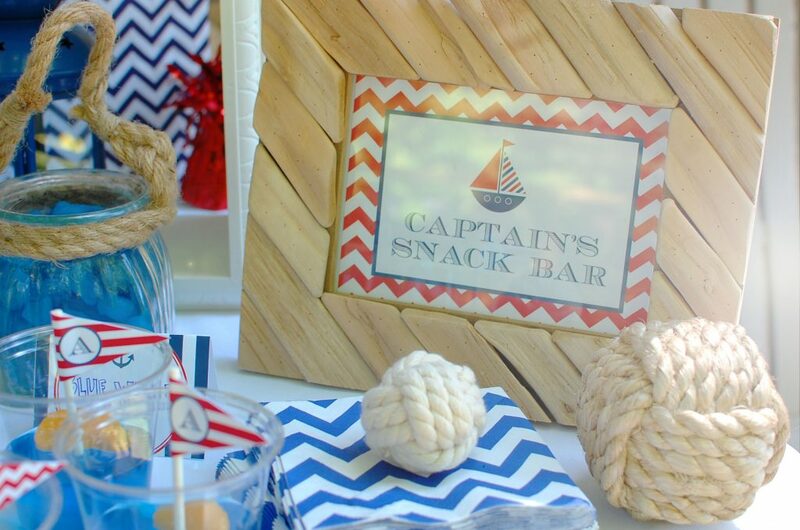 The “Captain’s Snack Bar” or “Sweet Treat Table” was full of yummy goodies (more details on those below) for party guests. The backdrop was a gigantic piece of chipboard that I covered with some chevron printed material I picked up at Fabricland and a large cardboard “A” covered in twine. The fabric garland table skirt was made with LOADS of strips of the material I had purchased from Fabricland and Hawthorne Supply Co., tied onto a piece of twine (see close-ups below); it was super heavy so I had to fasten it to the table with picnic tablecloth clasps I picked up at the dollar store. It ended up being windier than I had anticipated, so the balloons kept blowing all over the place (which drove me a bit crazy! ), but otherwise this table worked out exactly as I had envisioned! 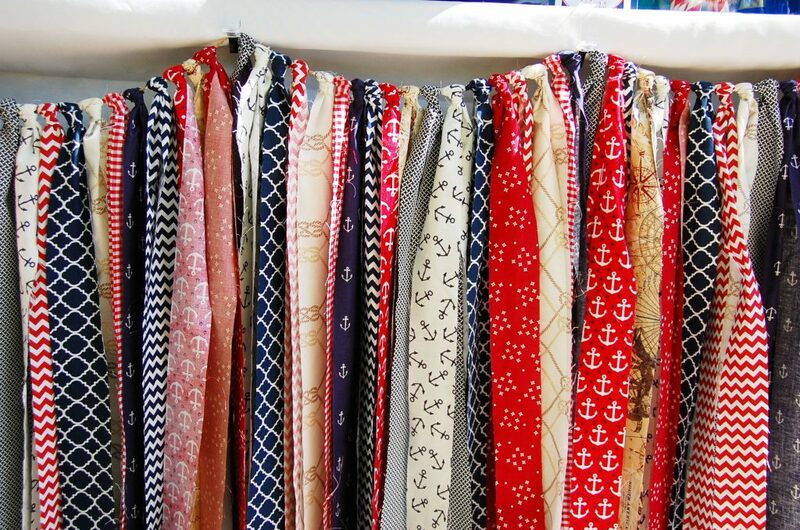 I absolutely LOVE fabric garlands. Although they require a pretty significant time commitment to cut all of the pieces of material, assembling them is quick and easy! 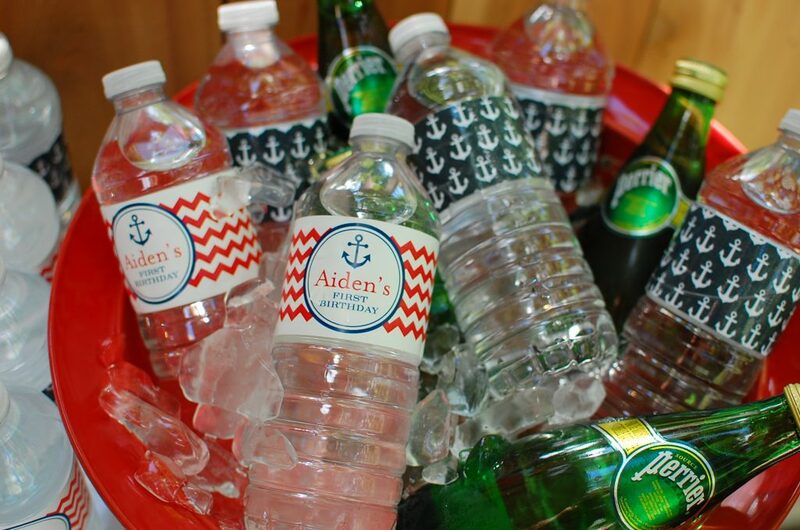 Plus, they add a nice vintage vibe to your party, so I think they are well worth the effort. 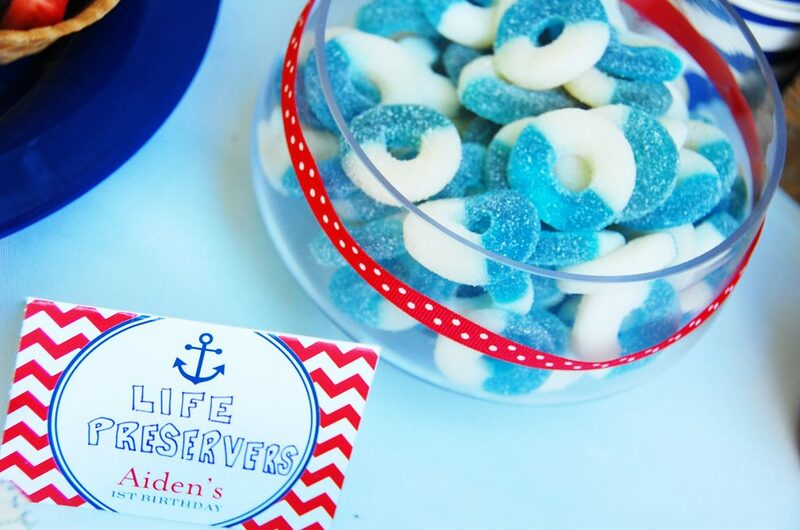 Nautical themed goodies filled the “Captain’s Snack Bar” for guests to munch on before the BBQ was fired up, including blue whale gummies (in background) and small plastic cups filled with blue jello, a mandarin orange slice (to look like a boat) and a custom made “sail” (in foreground). 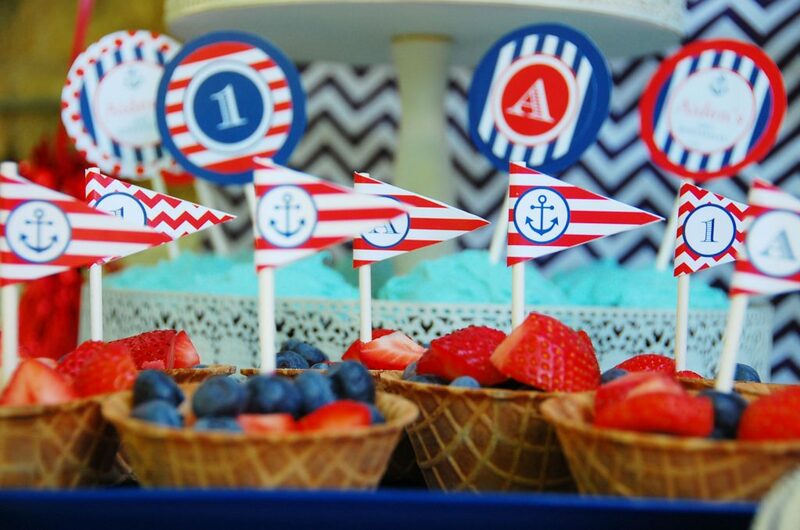 Waffle cone cups filled with fresh fruit and custom “sails” (in the foreground) were put out along with home made cupcakes with custom cupcake toppers (in the background). 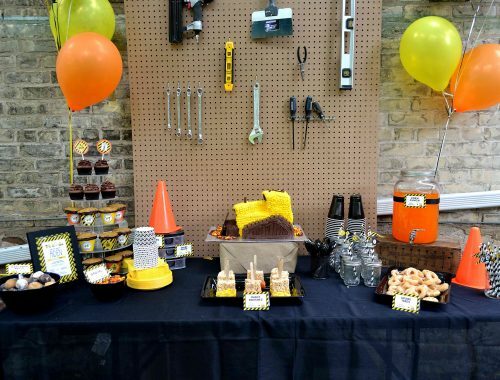 My favourite thing about themed parties is, by far, the opportunities they provide to tap into my creative side, like coming up with adorable names for all of the snacks. The possibilities are endless and it is so much fun! 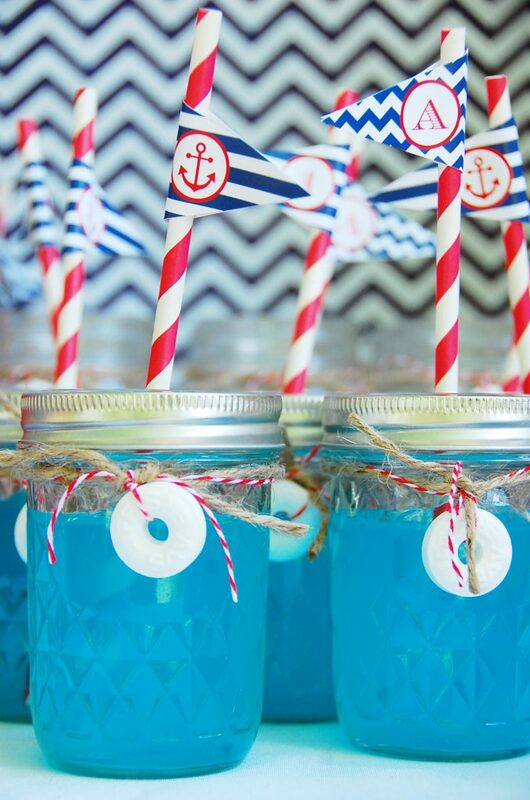 Blue “Ocean Water” was served in small mason jars, each adorned with twine and a white life saver, and a striped straw with custom flag. The cake. 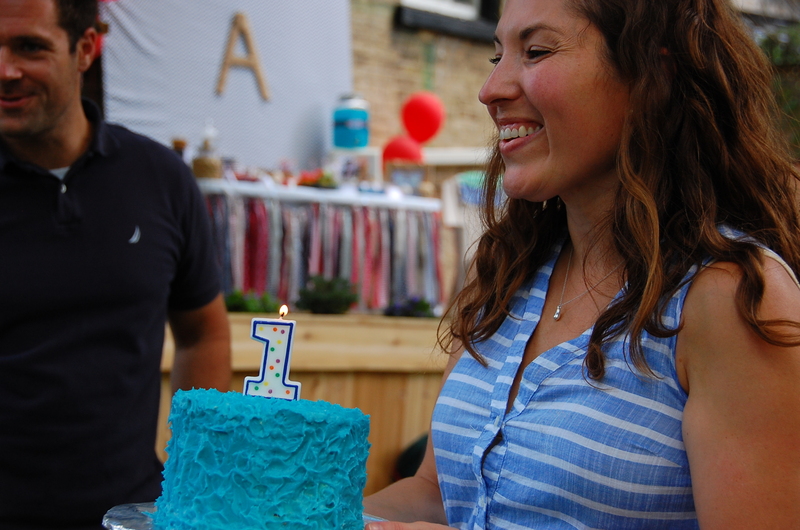 Oh, the cake. 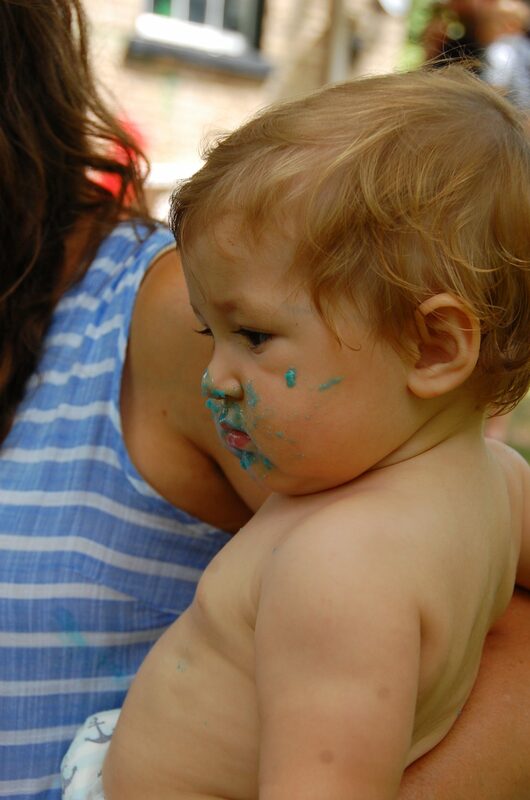 That cake was my nemesis. It was not kind to me. 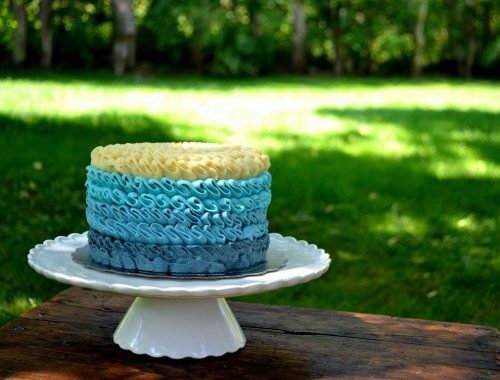 More details about the cake can be found here. 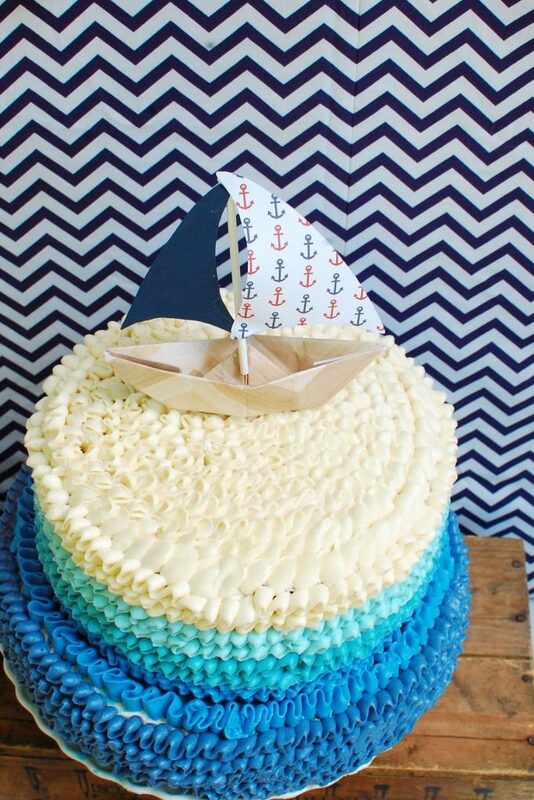 As for the cake topper, that was a tad easier and was handmade using craft paper I purchased at Michaels. 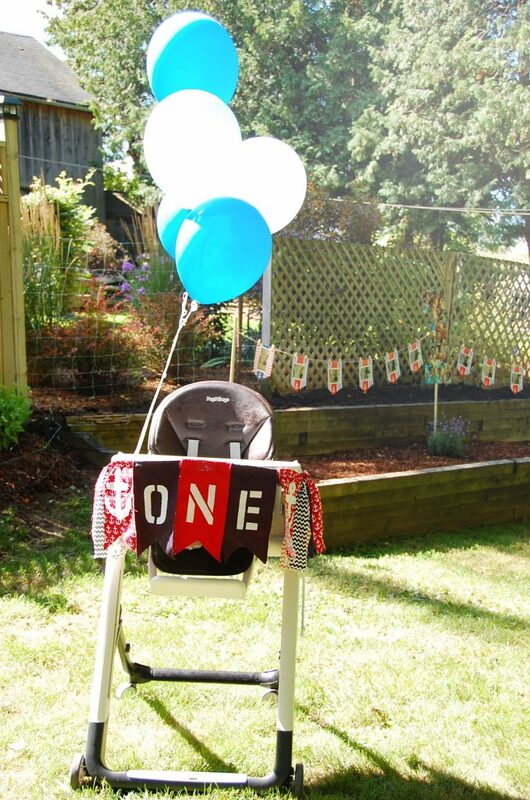 The birthday boy’s chair was adorned with balloons and a hand-made “One” banner, complete with anchors! Monthly photos of Aiden, and a collection of photos with friends and family in the shape of a “1”, were displayed in the flower box at the side of the yard (in the background). 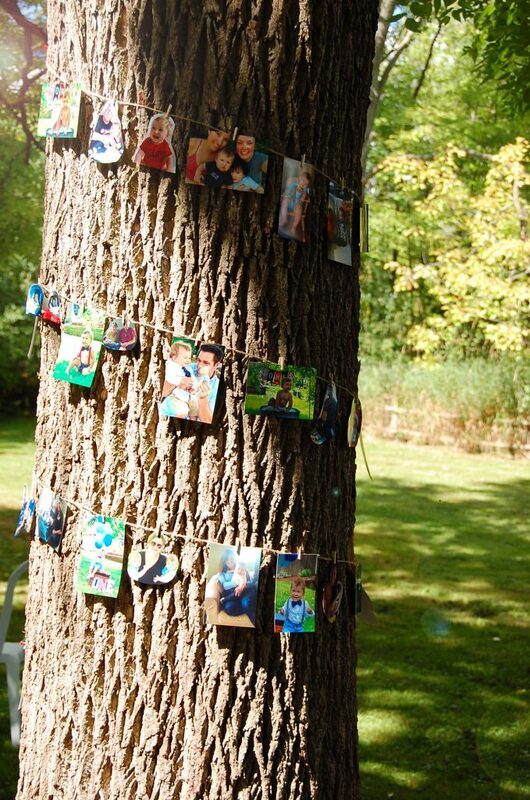 More photos with family and friends were clipped to twine and wrapped around the beautiful black walnut tree in our backyard for guests to enjoy. 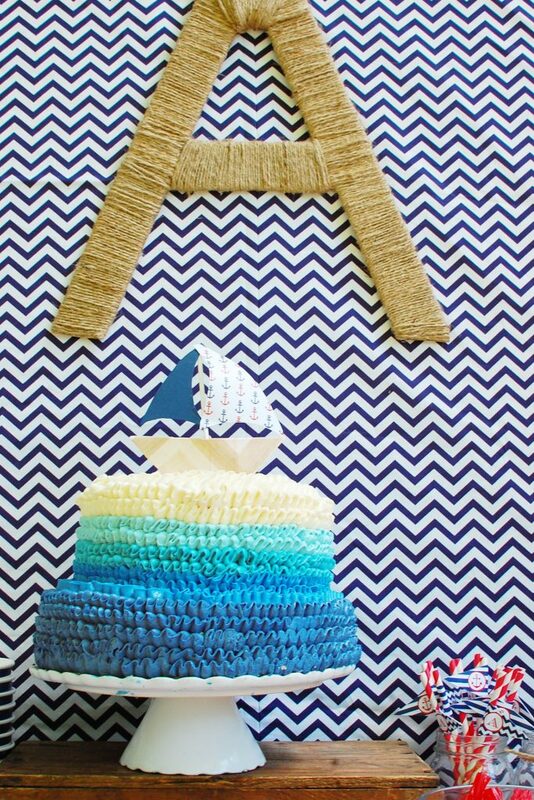 After looking at what felt like a million first birthday party boards on Pinterest, I knew I wanted to make a Milestone Board for Aiden. This one was super simple! 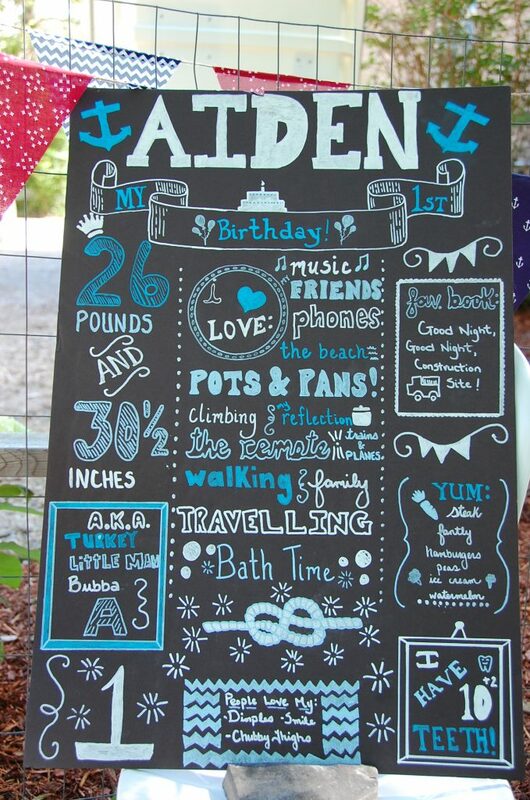 I purchased the black foam board from Staples and several blue and white chalk markers from Michaels, then simply started designing! These boards are such a great way to capture some of your little one’s personality traits and make note of some important milestones! Guests, especially family members, LOVED this! 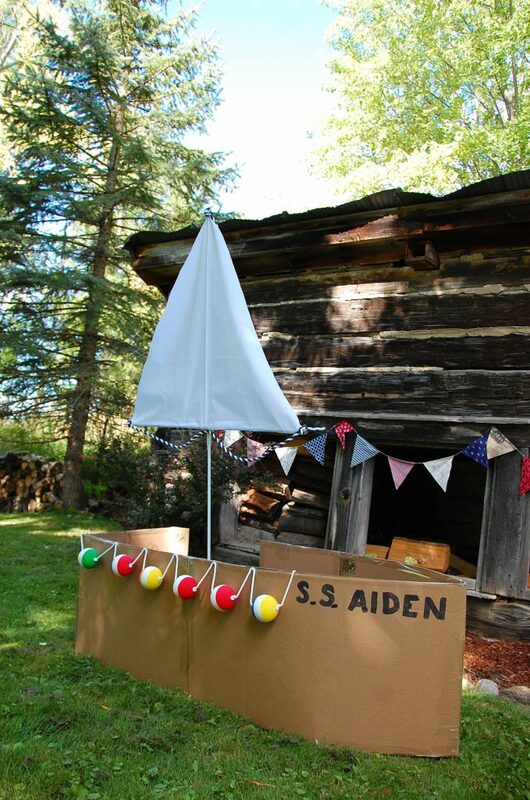 A nautical birthday party would simply not be complete without a miniature sailboat! 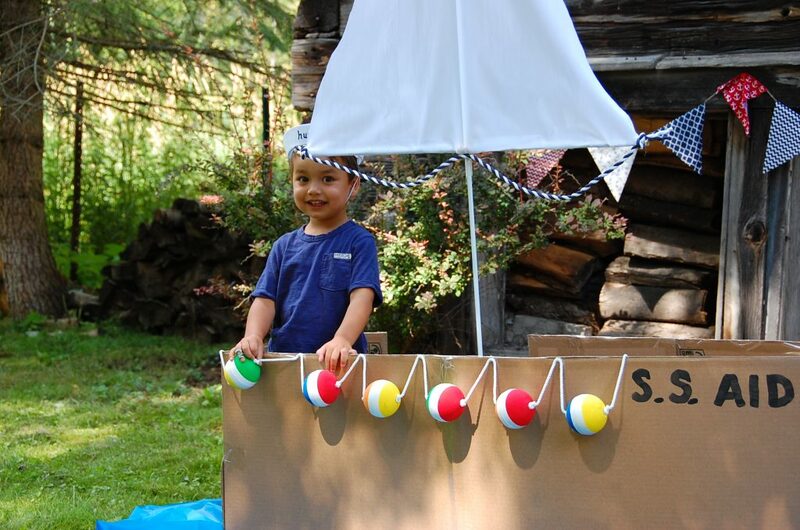 My mom and I assembled the boat using cardboard boxes (and a lot of tape!) and fashioned a sale out of two cheap curtain rods, along with some extra material and rope we had on hand. 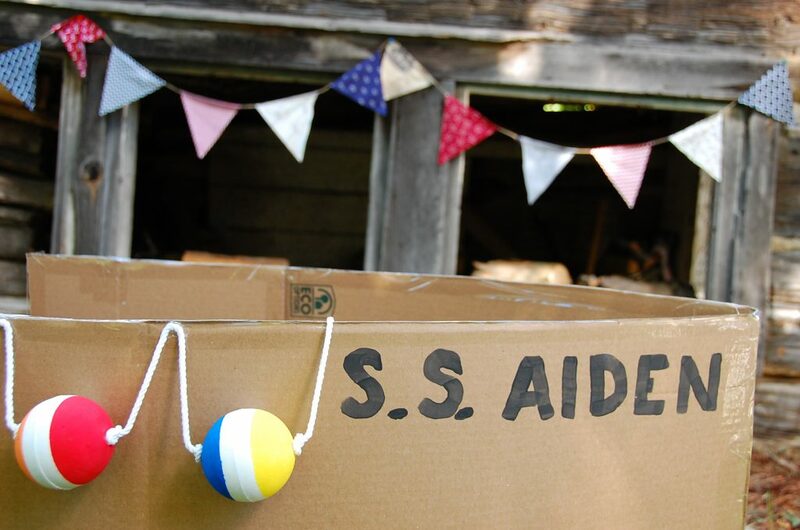 The buoys were made from styrofoam balls that my husband drilled holes through (for the rope line) that my mom and I painted. The whole thing was actually incredibly simple and provided a great spot for the little ones to have their picture taken (see more photos below)! We had a Polaroid camera on hand and a photo book that guests could add their picture to and write a message for the birthday boy (which doubles as a great keepsake!). 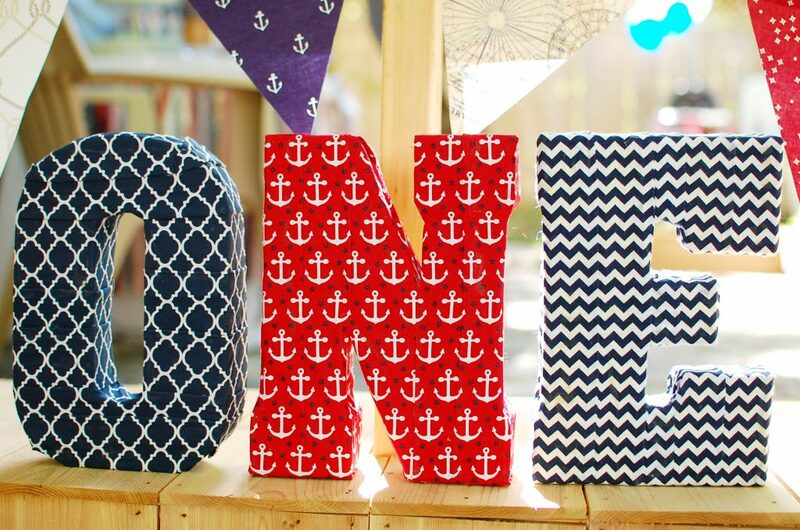 The “ONE” decoration was made from basic, free-standing metal letters I purchased from Michaels and then covered with pieces of the material I had purchased to make the fabric garland and pennant banners. In order to fully cover the letters, I had to use quite a few strips of material and lots of glue. 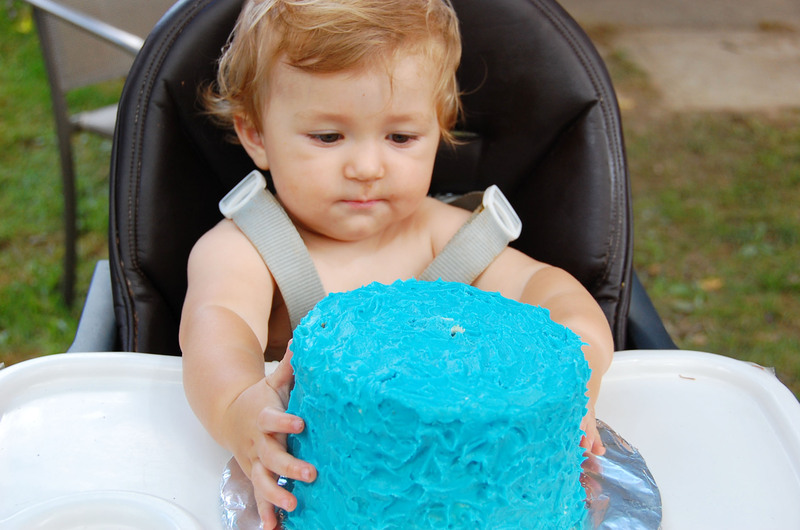 This decoration took a bit longer to make, but was well worth it because I used it twice – once for Aiden’s “One” pictures and cake smash session, and then again at his birthday party. 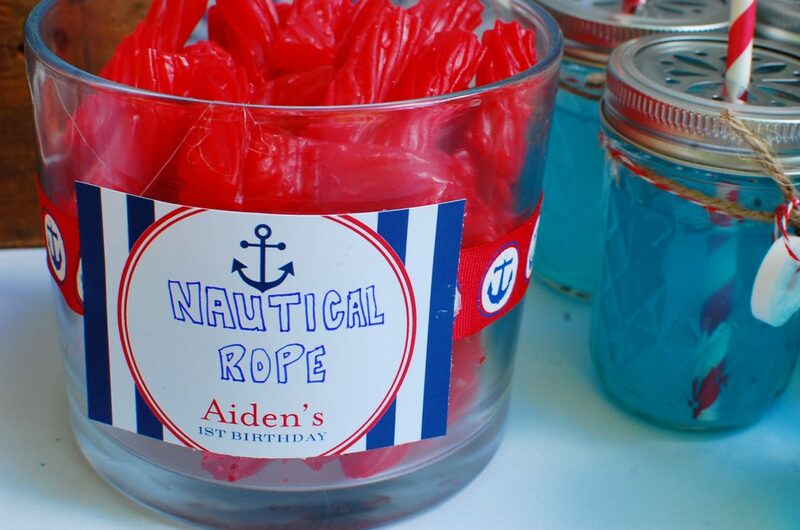 Salty snacks and water bottles with custom labels (some from Chickabug, LLC and some made by myself using strips of nautical themed paper and packing tape) were set out on the food table before lunch was served. Guests (both children and adults!) 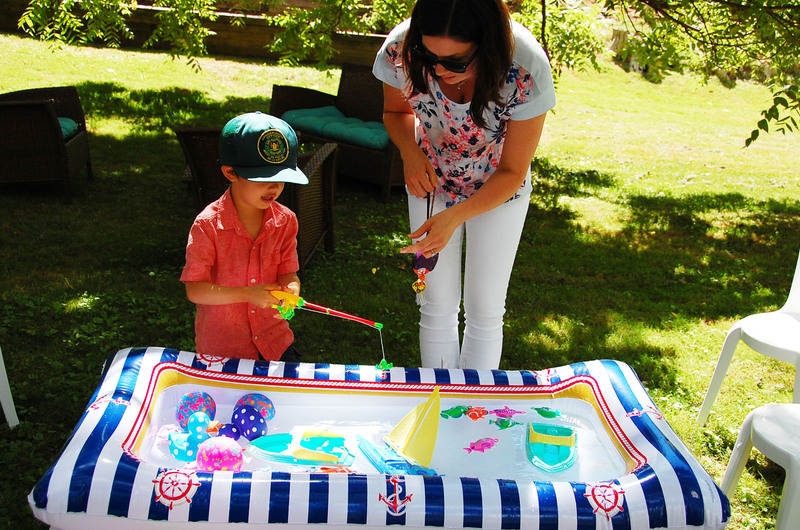 kept busy with the DIY water table, which was created using a large nautical-themed “cooler pool” I found at our local party store and filled with water toys purchased at the dollar store. 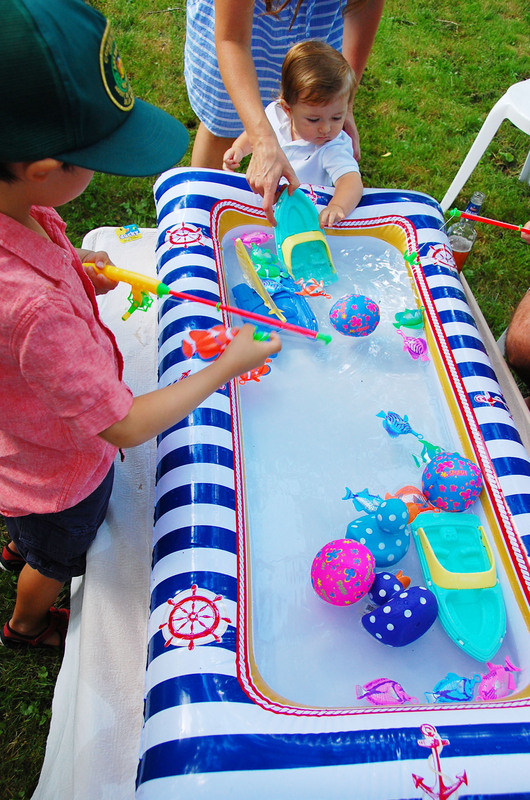 The toys later doubled as part of the party favours for the little sailors! The birthday boy (looking awfully sleepy) and I having a little mid-party snuggle. 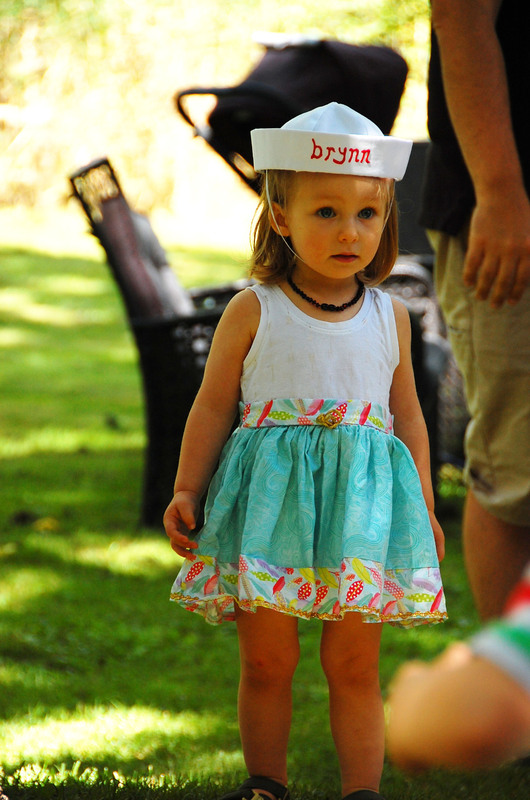 The party guests sure looked super cute in their party hats! 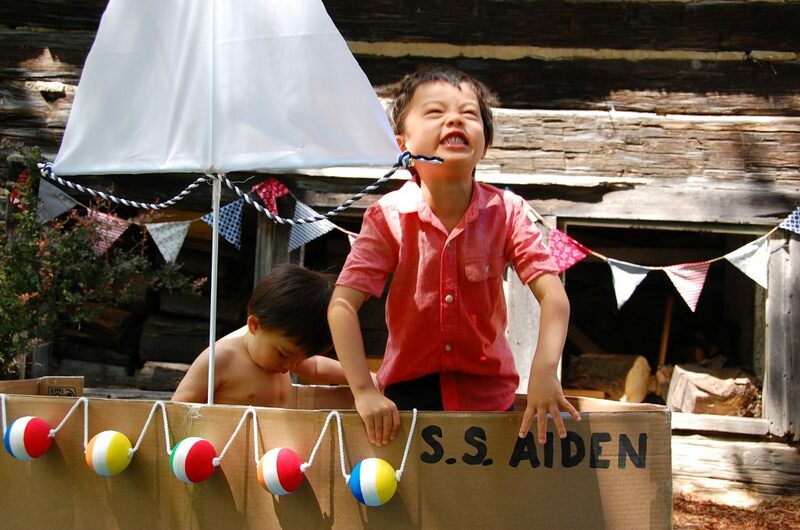 I think the sailboat was a hit! It looks like the cake was too! 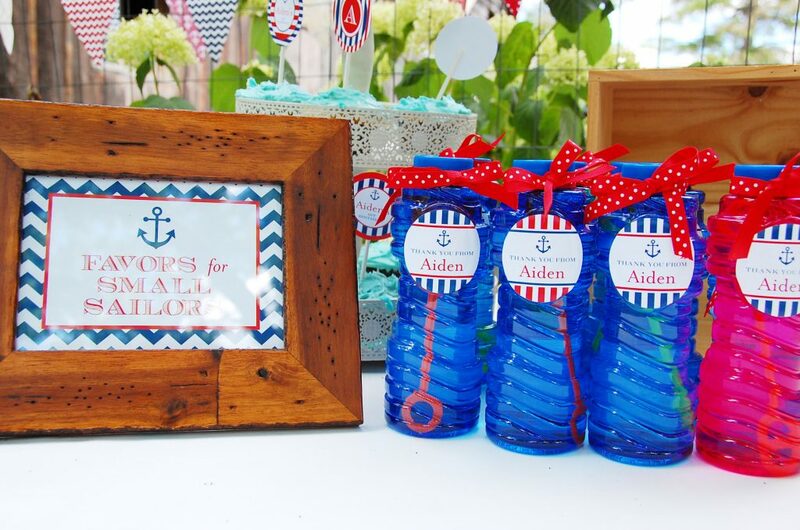 In addition to keeping their handmade sailor hats, little sailor guests were encouraged to pick one of the toys from the water table to take home, along with a jar of bubbles (because who doesn’t love bubbles?!)! 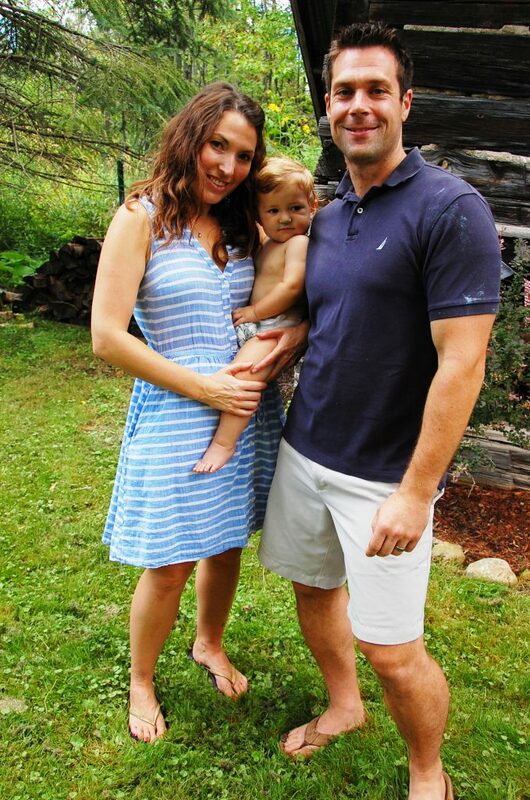 Our little family (just missing our fur baby! ), circa August 2016. 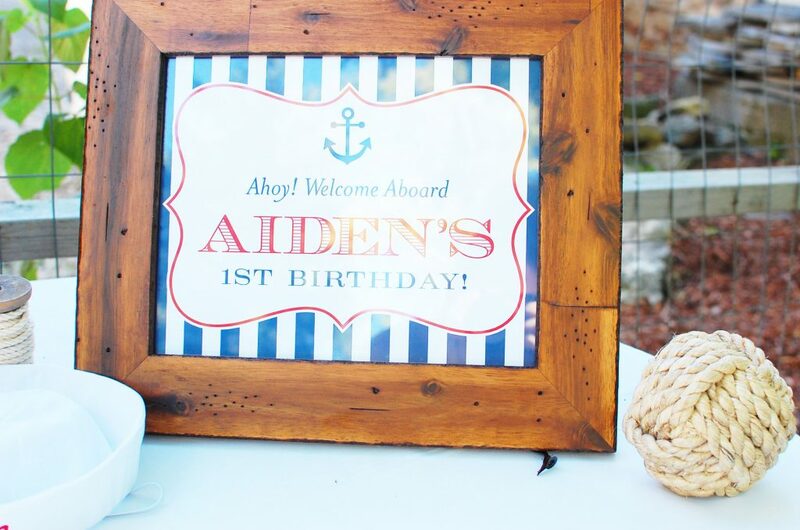 I had so much fun planning, prepping and hosting Aiden’s nautical first birthday party and am so pleased with how everything turned out! I honestly couldn’t have pulled it off without my mom, my dad and my husband; they were troopers, to say the least. And I would be remiss not to thank my friend, Laura, for her time in taking and editing all of these wonderful photos! 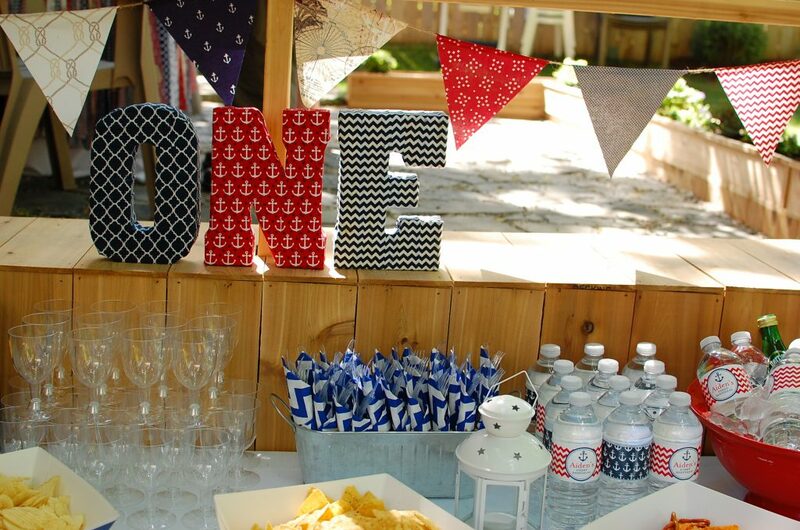 Did you throw a themed party for your little one’s first birthday? If so, leave a comment below – I would love to hear all about it!